Linguine with crab sauce brings me back to the days when I spent my summers at the Jersey shore. My Aunt Phyllis and Uncle Sal had a summer house in Brick, New Jersey right off of Mantoloking Road. Just down the road from their house was the bay that we used to walk to each day for swimming and beach fun. The highlight of my week was when my father would take me crabbing under the Mantoloking Bridge. We would get up early in the morning, after all, that is when fishermen went fishing, and pack the car with a large cooler, fish net, and crab cage. We also had crabbing lines that simply consisted of a length of string with a weight attached to one end and a safety pin type hook that you attached the bait to. The idea was to lower the bait to where the crabs were and wait a minute or two. You then slowly brought up the line and as you got closer to the surface you would see the crab feeding on the bait and scoop them up with the fish net. It worked like a charm. The crab cage was another method of catching those blue claws. It was a box like cage that you secured the bait to. When you lowered the cage to the bottom of the bay the doors would fall open. After a while you yanked the line to close the cage and hopefully pulled up a cage full of crabs, Alla “Deadliest Catch”…but not quite as deadly. When we got to the Mantoloking Bridge my father would park his car and we walked over to the boat rental store just off to the side of the bridge. I didn’t know if I was more excited to get on a boat or to go fishing and crabbing with my father. My father paid the man the fee and bought some bunker bait along with bait squid we would use for the fishing lines. Between the two of use we had it all taken care of. Fishing, crabbing, we would go after the sea gulls if we thought they were good eats. We put the bait in the buckets and coolers we brought along to haul our catch back with and walked out to the docks to get into our row boat. My father would row to get us out of the docking area and I would pitch in from time to time once we were free from the piers. Once we found our spot I would throw out the anchor and we began to bait our lines. I can’t tell you how excited my father and I got when we began pulling up the first load of blue claw crabs. I think my father saw those crabs as payback for the money he had to spend in order to catch them. Within hours the buckets and coolers were filling up with crabs. And back then, when you threw in your fishing line it never took long for the blow fish to bite. We must have caught a dozen blow fish that day. My father called them “chicken of the sea” because after you cleaned them and fried them up they looked like chicken legs, and were just as tasty! By the time it was noon we were loaded with crabs and blow fish and were ready to call it a day. The heat of the sun hitting us out on the water just made me want to jump in and cool off. But I knew once we got back to the house we would head for the beach. 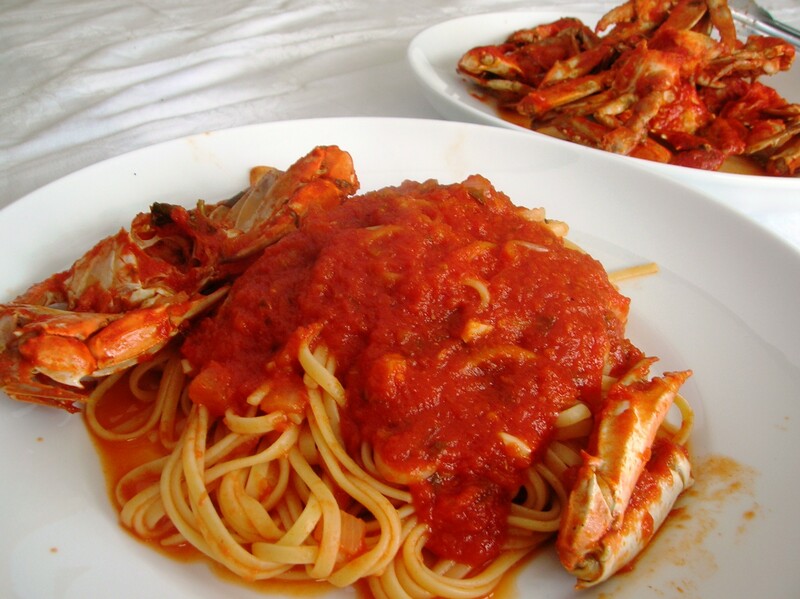 That night my mother and aunt prepared the crabs and made a delicious crab sauce with linguine. I almost recognized each crab that we caught as they pulled them from the sauce and placed them on a platter. Especially the giant one I caught that almost took off a finger when I tried to get him in the bucket. That one I wanted to eat myself. The tradition of crabbing under the Mantoloking bridge continued when I had my children. I would bring both my boys Michael and Joseph to the same spot my father brought me. The same shack was there with the large wooden sign painted in red, “Boat Rentals”. We had our cooler and buckets and crab cages and lines. Only thing that was missing was the fishing poles. The blow fish disappeared. I could only tell my sons about the dozens of blow fish I used to catch with their grandfather as soon as we put our lines in. And when we got them in the boat they would blow up like a balloon and make weird squeaking sounds. But the crabs were still there. And my sons experienced the same thrill of pulling the crabs to the surface and netting them. Only this time, they didn’t want to go near them as the blue claws scurried sideways around the boat with their claws open and waiting to catch a toe or finger. I had to get them into the buckets. When we got the crabs back to the house all I could think about was that delicious sauce my mother made. Unfortunately, because of that I wasn’t thinking very clearly and an “Annie Hall” moment was about to unfold. We must have had over two dozen angry blue claw crabs in the cooler. In an attempt to empty the cooler into the sink and rinse off the crabs before I placed them into the boiling water, the crabs had another idea and were not going to go peacefully. When I was a child I had a game called Barrel of Monkeys. The object of the game was to lift one monkey out of the barrel and see how many monkeys would cling to each other as you lifted them up in a long chain. Well, these crabs must have been briefed on that game, because as I dumbed the cooler over the sink the crabs clung to each other and formed a “crab chain of monkeys” as they climbed up and over the kitchen sink and scattered everywhere over and down to the kitchen floor. When I was done with that maneuver there was not one crab in the sink! They scurried and ran under every nook and cranny that was in the kitchen….along with my children that ran out of the way and stood on top of the kitchen table and chairs screaming. All I could think of was, how on earth am I going to get all these crabs caught….again! I told everyone to calm down as I ran around the kitchen with ice tongs trying to catch the scampering crustations. My son Michael would yell out, “there’s another one! Over there!! !”, as I raced to get these crabs back in the cooler. One has to admire the survival skills of crabs. I eventually rounded up all of them and took them out into the yard and rinsed them off with the hose, which is what I should have done in the first place. At the end of that ordeal I prepared the crabs for the sauce. My sons looked on as I showed them the proper way of cleaning them. My son Michael asked how was I going to kill them. I’m guessing he didn’t want to see them escape again. Neither did I. 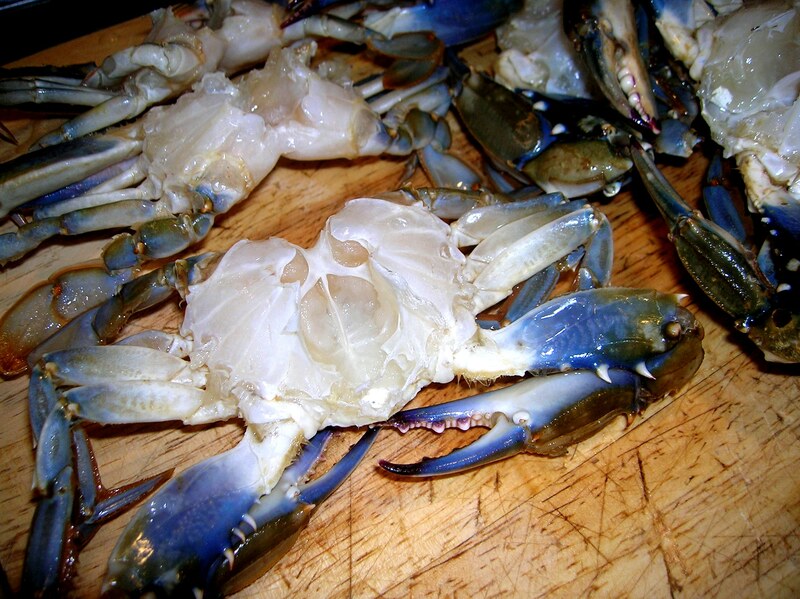 If you don’t have a supply of fresh crabs, many supermarkets and fish mongers carry frozen blue claw crabs. 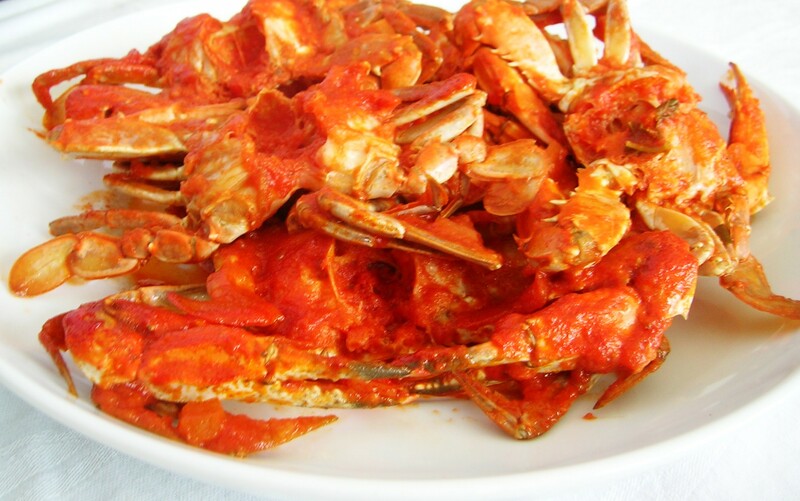 You can use any type of crab for this sauce including dungeness, even snow crab and king crab. 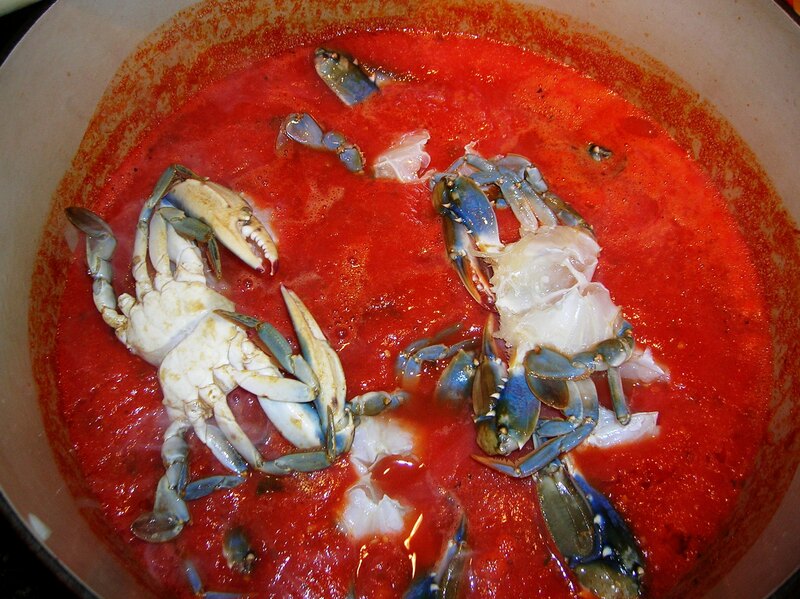 If you have fresh caught crab, boil a large pot of water to fit the crabs and plunge the crabs into the boiling water for 5 minutes or until they turn a bright red. Drain the crabs and run cool water over them so they will be easier to handle. To clean the crabs turn them over and you will notice on the bottom there is either a pyramid shape (female) or a long narrow shape (male) on the crabs underside. If you get a knife or your nail under this shape and pull it towards the back of the crab ( like a pop top can) you can pry off the top of the crab shell. Discard the top of the shell along with the mouth portions and the gills of the crab that are right under the top shell. Rinse the crab under cool water and you’re good to go. This is what a cleaned crab should look like. In a large sauce pot over medium heat add the olive oil. Saute the onions until translucent. Add the garlic and cook 1 minute or until they just start to turn golden. Add the white wine and cook down 2 minutes. Add the pureed tomatoes, basil, salt and pepper and bring the sauce to a simmer over medium low heat. Add the cleaned crabs to the sauce and cook over medium low heat for about 1/2 hour, stirring occasionally. 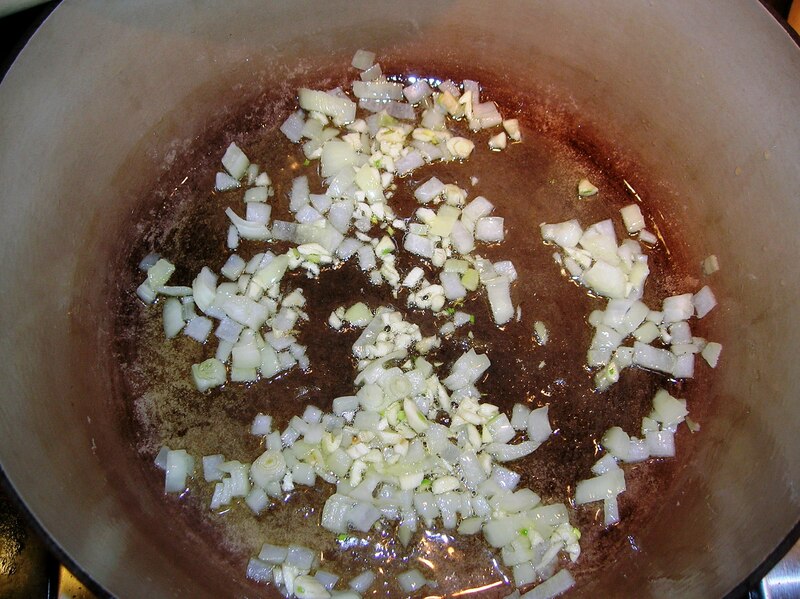 In the meantime bring a large pot of water to a boil, add 1 tablespoon of salt. Cook the linguine al dente, about 9 minutes. Remove the crabs from the sauce and place on a platter to eat later. Drain the pasta and serve with the crab sauce. Sprinkle with Parmesan or Romano cheese. Once the pasta is consumed you can spend the rest of the evening with an ice cold beer or glass of wine picking through the crabs. My favorite part! This entry was posted in Pasta, Seafood and tagged crab sauce, linguine with crab sauce, pasta with crab sauce. Bookmark the permalink. I wasn’t in the mood for hot pepper with this sauce, but by all means, add it if you enjoy it! Where have you been all my life. This is the recipe I have been looking for. I want to make this for Christmas eve for 10 people. How many crabs should I buy? Joanne, If everyone eats about 3 crabs each that is over 30 crabs, more than you need to make the sauce. I would figure a crab each, it’s more for the flavoring of the sauce. Those who want to can pick at the crabs. I’m sure others will eat whatever else you are serving. I understand your confusion, sorry. The photo was from store bought uncooked cleaned crabs. The text is correct, just follow it if you’re using fresh live crabs. Seems a waste to discard the shells instead of boiling them in the pasta water for extra flavor (or freezing for a later stock). 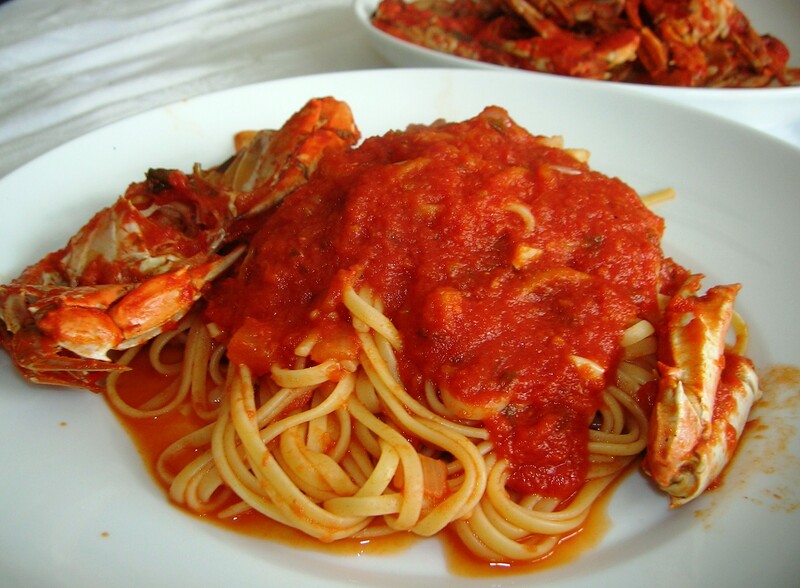 My mother once made a crab/lobster linguine and I remember it well too. Am I to assume you don’t actually put actual meat in the sauce but you put shells and all? Wouldn’t that be messy/difficult to eat? Suzanne, rolling up your sleeves and picking away at those craps are half the fun after enjoying a plate of that wonderfully flavored macaroni. We keep plenty of paper towels handy. Yes it is messy – like eating in-shell cioppino. Lots of napkins and definitely a lobster bib! Looking forward to making this when it warms up and I can buy live crab at the Jersey Shore! You brought so many memories for me. I was raised in Southern NJ and the shore was the place to go every summer. I love crabbing, I love eating crabs more. Thanks for bringing me back to a fun time in my life. The recipe is wonderful. Julia, some of my fondest memories growing up is spending summers at “The Shore”. Glad you can relate.